The Inca Trail starts in Ollantaytambo, where you receive a small duffle bag and your rented equipment (in my case a sleeping bag US$20 and walking poles US$15). Anything that fits into the duffle is for the porters to carry and cannot weigh more than 6kg. You really do need to pack for all kinds of weather! The porters each carry packs of 25kg or more, including the duffle bags, tents, tables, chairs, toilets, gas bottle, the kitchen, food and more. 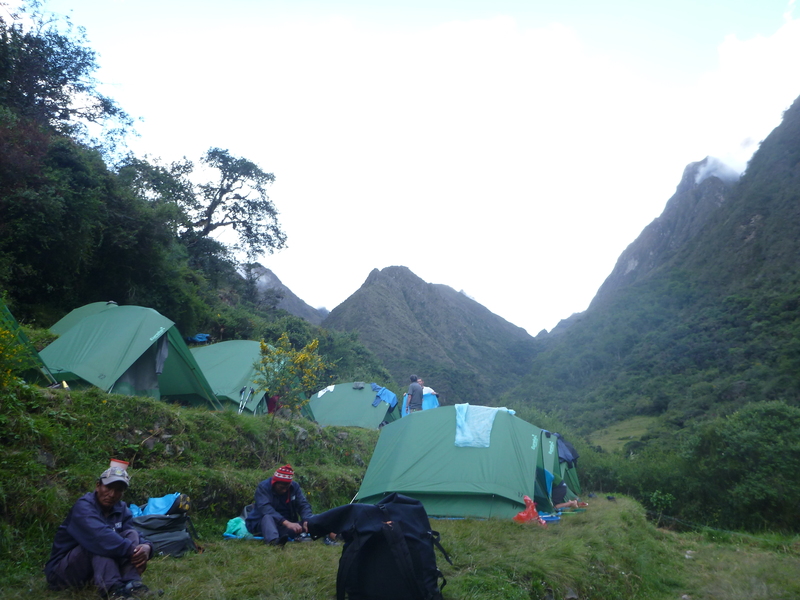 We had a group of fifteen people, supported by three guides, Ruli, Elvis and Monica, and twenty-four porters. 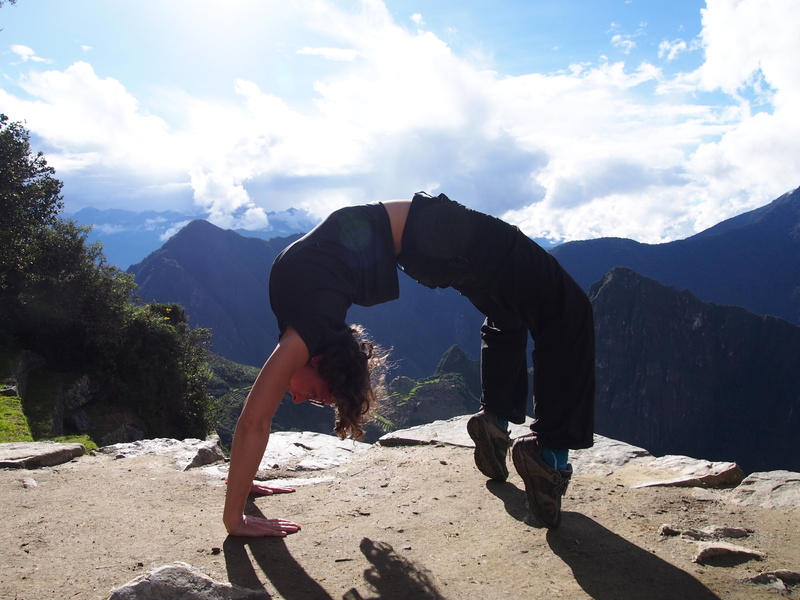 On the first day we caught a bus to “KM 82” of the Inca Trail. This is a place known to the locals as Piscaqucho, which means five corners. The starting elevation at this point was 3,375 metres. 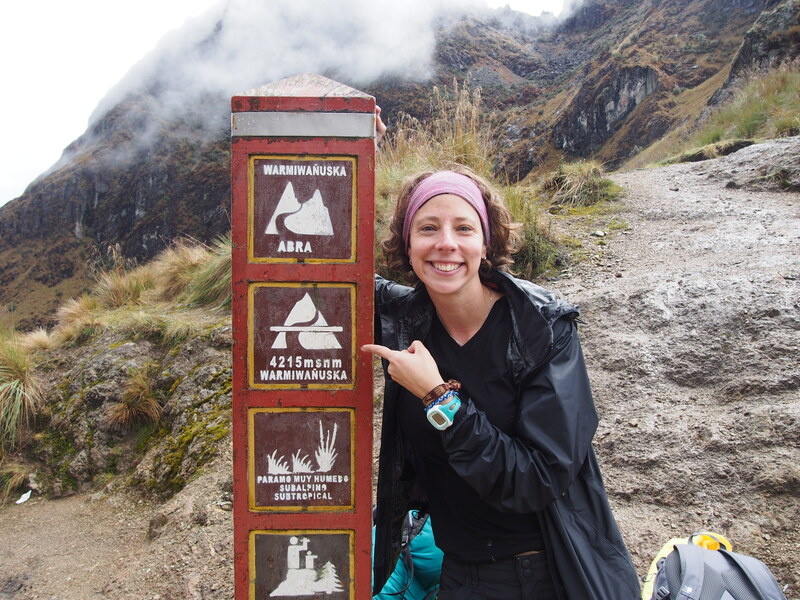 The very start of the Inca Trail has a check-in point where you provide your passport; it is cross-checked against your Inca Trail permit and then you receive a stamp. Due to the rain we had layers of rain coats and ponchos. 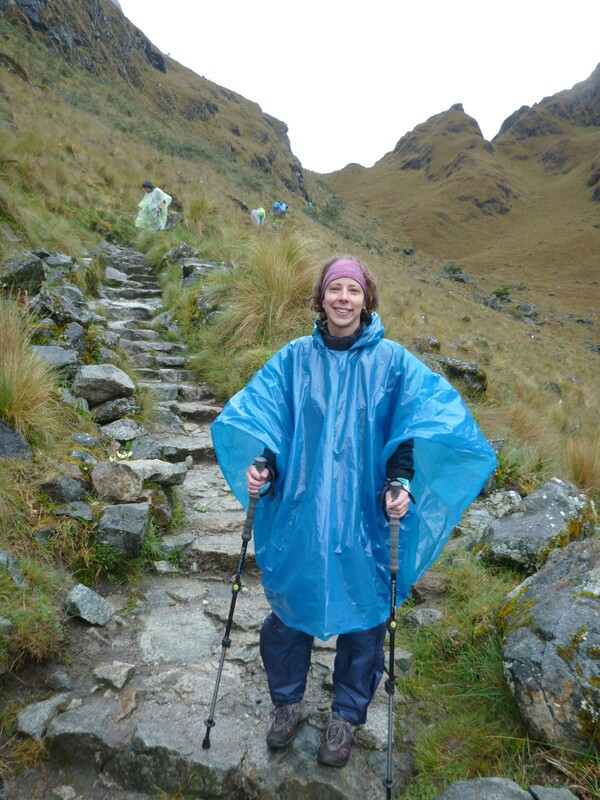 As we stepped onto the bridge to cross the Urubamba River and start the Inca Trail though, the rain simply didn’t matter. 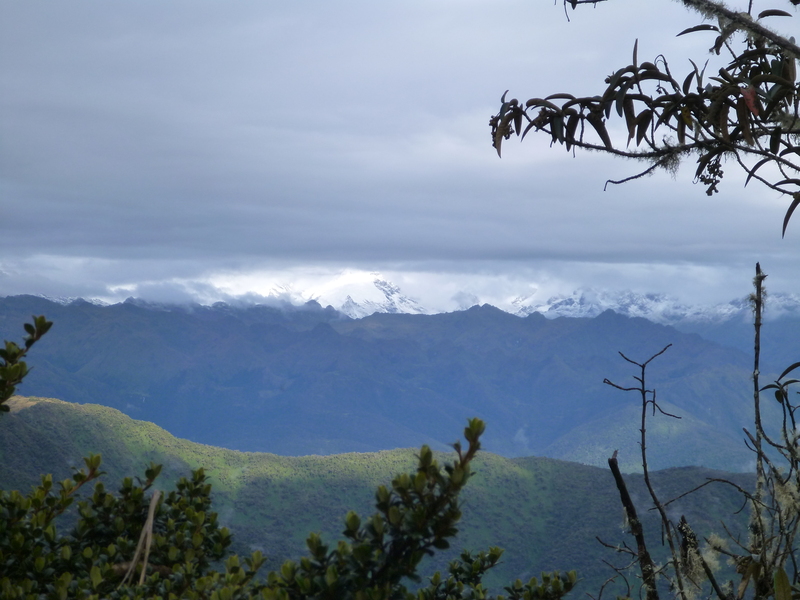 The walk was up and down hills, and we saw many beautiful mountains and some Incan sites along the way. By 1pm, we were all hungry. 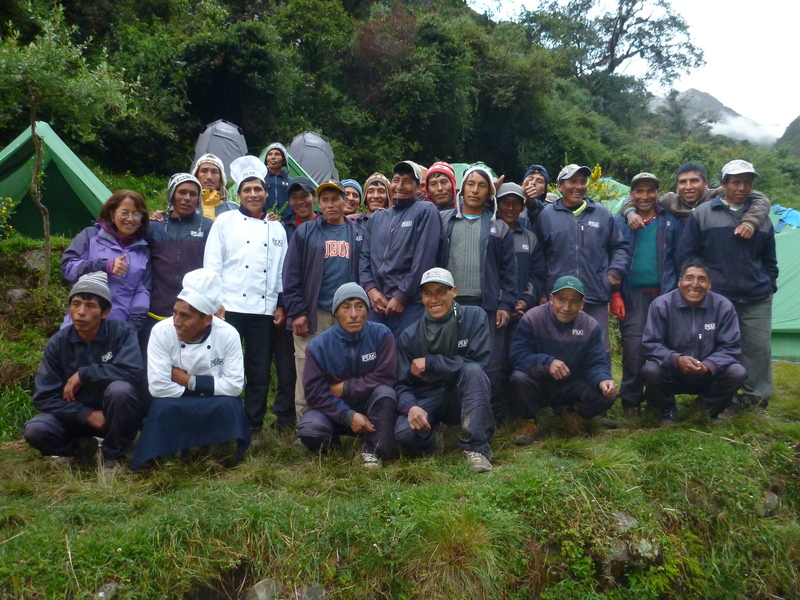 We met the porters at Hatunchaca for lunch. There they had set up a kitchen tent, dining tent and toilet tents. We had a delicious three course meal for lunch, followed by cups of tea and then we were on our way again. The trail ended on an incline and spirits were high as we walked into our Wayllabamba (3,000 metres) campsite around 4:30pm. Once we were allocated tents and given the lay of the land, it was afternoon tea time. Hot chocolate, pop-corn and cookies! We remained seated and chatting, a three-course dinner was served and then we were all so tired, it was time for bed. Due to landslides at the normal campsite for day 2, our campsite was set for some distance further along the trail, which meant that we had to walk further than normal on Day 2 and that our hike would actually finish on Day 3 instead of Day 4 (which we excitedly learned meant we would see Macchu Picchu twice). This meant an early start, with our wake-up call and Coca Tea at 4:45am. Very dopey, we all packed our bags, had our breakfast, layered up in raincoats once more and put our packs on, to start making our way up to the highest point of the trail, Dead Woman’s Pass. With the altitude and the sharp incline, it was quite slow going. Maintaining a slow and steady pace, we reached Dead Woman’s Pass, an elevation of 4,215 metres. The rain cleared just as we reached the peak. This was such an incredible achievement – we were all really excited to have made it, and celebrated with a snack and an amazing view. At each stopping point our guide told us something about the environment or the culture, which made the journey a rich experience. One of the things Ruli would regularly say after explaining something or telling us what we were going to do next was “Clarito de Luna?” — Clear as the moon? — in order to check if we understood. It became a cherished saying along our hike. With such a big day ahead, it was soon time to carry on. We crossed the top of the pass before heading down a steep decline on the other side. We continued down and down to 3,600 metres where we were able to stop for lunch at Pacamayu. This is the normal camp site for Day 2. 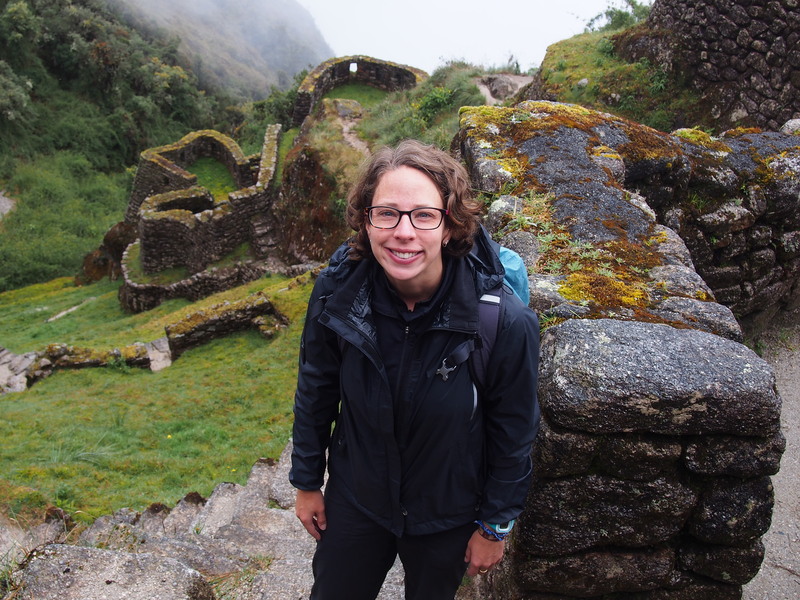 After quickly recharging our bodies with food, we were off again, headed up to the Incan ruins and then the second pass, both of the name Runcuraqay. The pass was 3,800 metres and a much steeper incline than Dead Woman’s Pass. The rain came back and it was time for ponchos once more. Through the rain and mist we had a quick look at another Inca site, Sayacmarqa, high on a hillside at 2,650 metres before continuing onto to our campsite for the night at Chaquicocha (I think the elevation was around 3,200 metres – slightly higher than the first night). After a full day of rain, a swampy campsite and roughly eleven hours of hiking we weren’t the most excitable group of hikers at that point in time. The cooks certainly raised spirits with another amazing three-course meal, and this time the main dish was Spaghetti Bolognese. The dinner tent was silent as everyone tucked into the amazing meal! The third day started off dry and despite a few moments of drizzle was predominantly a perfect day in terms of the weather. It was to be another long day, but slightly less physically challenging than day two. 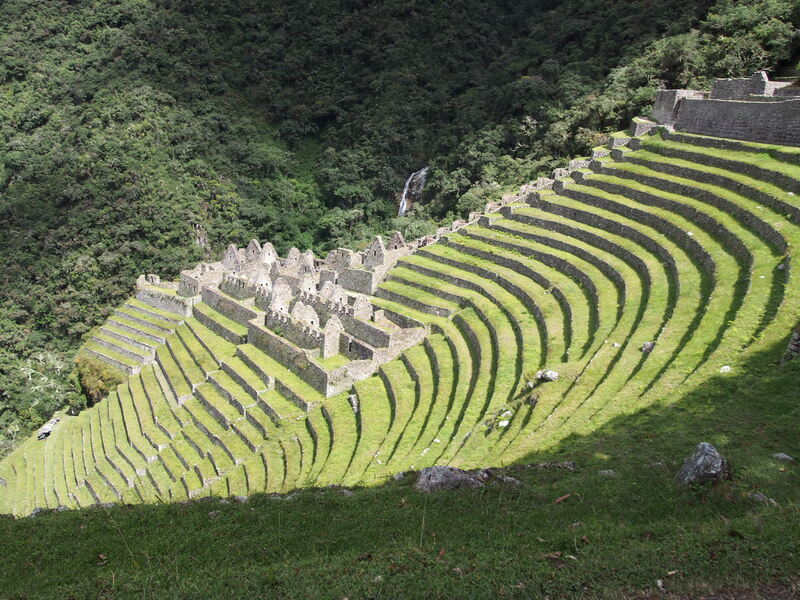 As we were nearing Macchu Picchu, there were more Incan sites along the way. We stopped at Phuyupatamarca (3,640 metres), Intipata and the had lunch at Wiyñawayna (3,640 metres). They are all such amazing sites to see and each one is different. 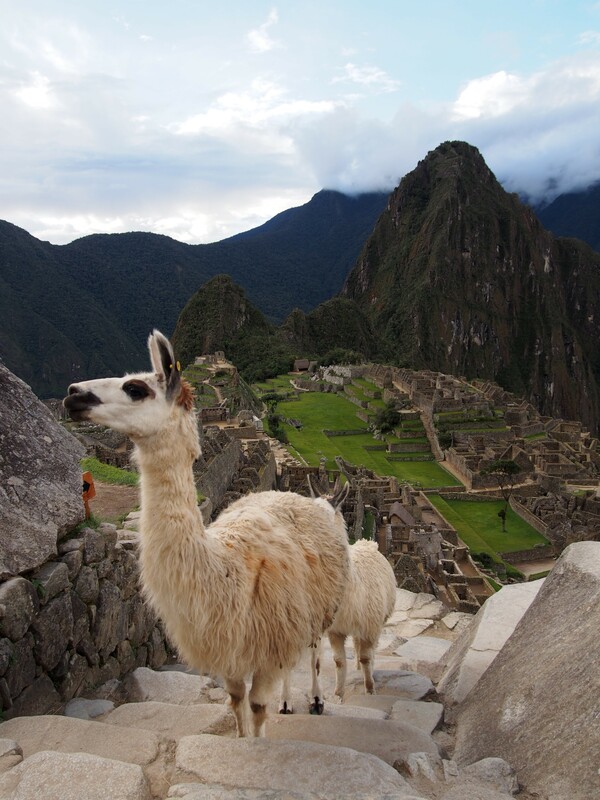 We learned a great deal about Incan/Andean beliefs and one of them stuck with me. It’s the Andean Cross (Southern Cross) symbol. It is known as Chakana, and is split into two halves which each have six steps. Each set of steps is a group of beliefs. The Andeans have a strong connection to the earth and a strong sense of community. One set of steps is about reciprocity. If you help someone, some time later they will help you. This may be on a one to one basis, or a community helping a neighbouring community or on a more global scale. But maintaining the idea that if you do something positive for someone, you will have it returned. I really like that philosophy. I guess we sometimes refer to this as karma, though I’m not sure if it’s really the same thing. After lunch we were told it was just two hours to the Sun Gate (Intipunqu), where we would catch our first glimpse of Macchu Picchu. 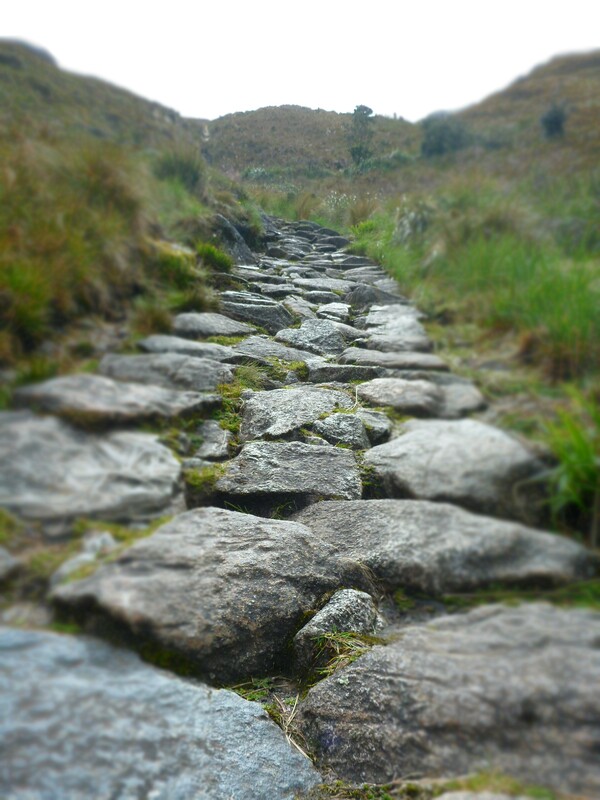 So we put on our packs and with a spring in our steps continued along the undulating Inca Path amongst the rainforest. When I stepped through the sun gate, I was just breathless. A lifetime goal was achieved and I stood looking at one of the most amazing sites I had ever seen. In the distance was Macchu Picchu (at 2,450 metres), the lost city of the Inca’s. Bathed in sunlight, set against a blue sky it simply glowed. After about twenty minutes of staring at such a wonderful site, we quickly had to descend into this wonderful city before they closed for the day. We arrived exactly on closing time and had to beg the guards to allow us to take ‘just one picture’ before we had to leave. We were so blessed to be able to enter this magical city when there were no other visitors. Despite our rush to take a picture (or ten) it was such a calm place to be. We were all very quiet, taking it all in. 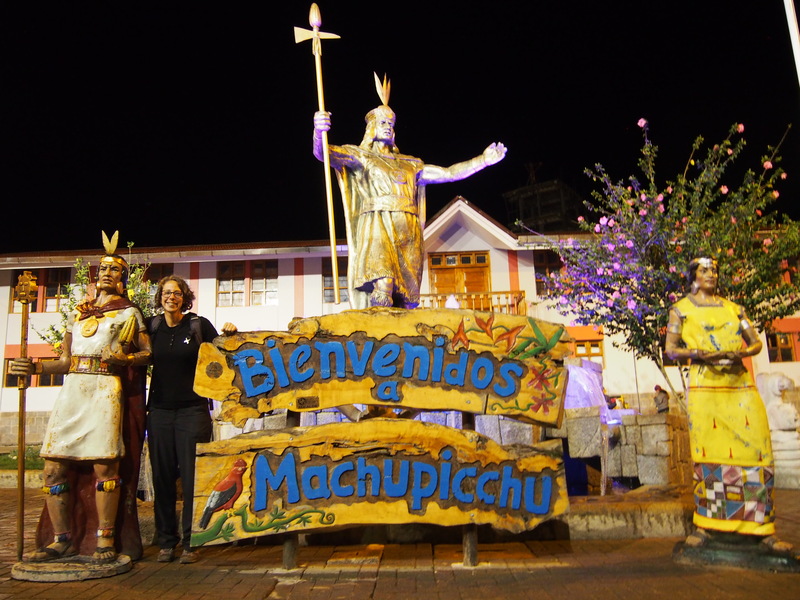 Once the guard starting to get cranky, we all headed out of the site, had our passports stamped and hopped on the bus to Macchu Picchu town, officially known as Aguas Calientes (2,050 metres). Another unfortunate (or fortunate in some ways) circumstance around the ‘new’ last campsite was that due to all the rain, it was flooded. Though none of us would have chosen to stay in a hostel, we were all quite relieved when that decision was made for us. Every single one of us thrilled at the idea of being warm and dry. We celebrated our hiking success and luck with the weather with a beer and meal together, before crashing in our dry, warm beds. The final day we caught the bus back up to Macchu Picchu, where it was rainy once more. Our tour guides gave us a tour of the city, and thankfully the clouds parted and the rain stopped. 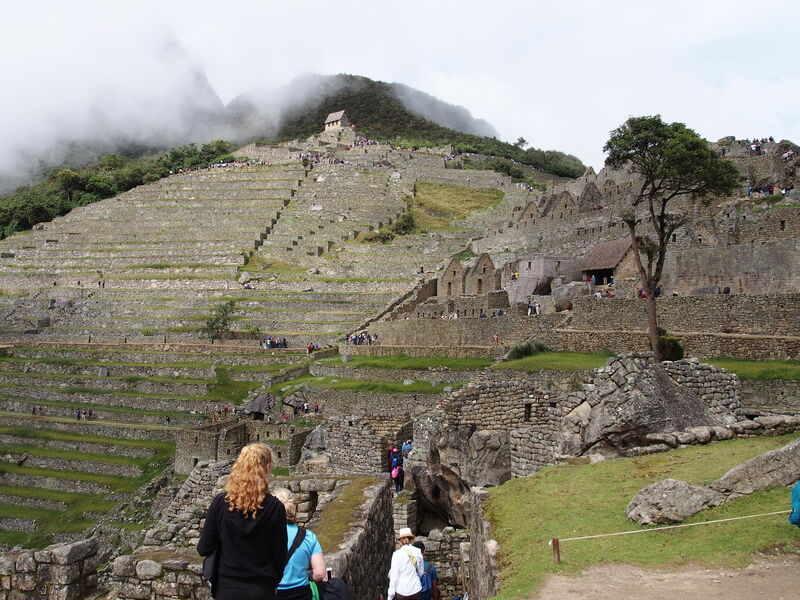 We got to wander the streets on the Inca City, learning about the Temple of the Sun, Temple of the Condor and more. We learned that the blocks were ‘cut’ by the Inca’s observing each stone, finding the natural veins, chiseling a small hole in them and the putting in dry timber, as the timber got wet it swelled and caused the stone’s to split perfectly. 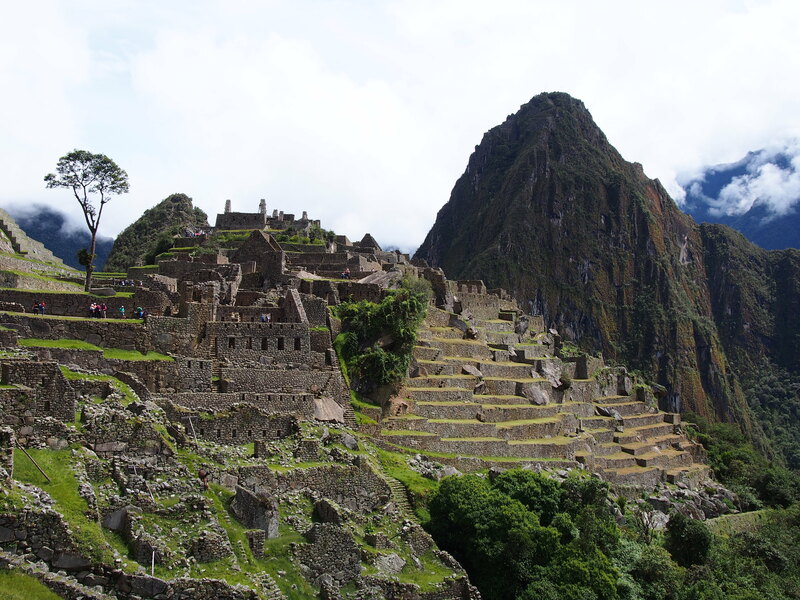 Everything the Incas did was closely linked to nature, their positioning of Incan Sites and buildings within them. They were such an amazing people. 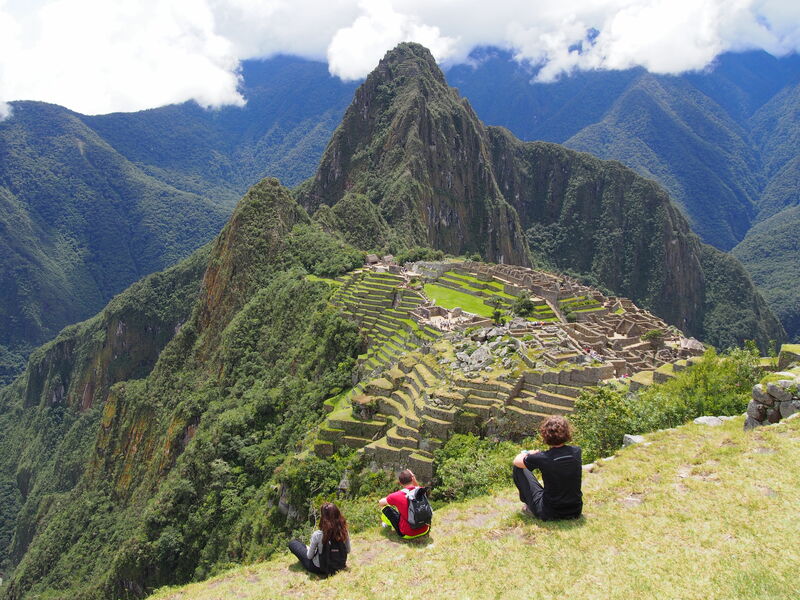 The Macchu Picchu site is very hard to describe as it’s simply so amazing. Hopefully some pictures will suffice. All too quickly our time at Macchu Picchu came to an end, we caught the bus back into town, had some lunch and then started our 5 hour journey back to Cusco. 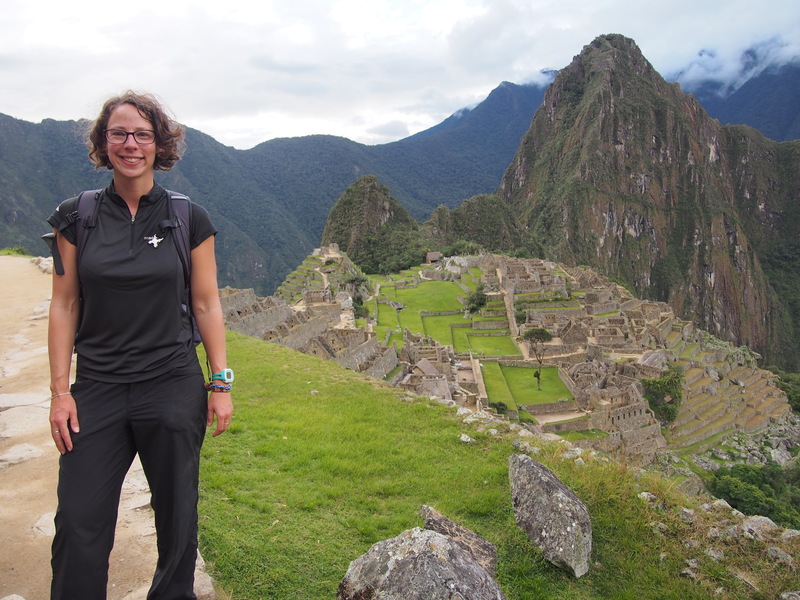 For all my Inca Trail & Macchu Picchu photos, check out my album on Flickr. Thanks Chikadee – I’m really proud of my achievement! Despite being a bit discouraged by the rain and cold, I didn’t cry or whinge once! It’s called Dead Woman’s Pass because at a distance it looks like the silhouette of a woman lying on her back. The guinea pig..it was a struggle! Someone order it last night and I tried it again. I gagged so badly, I had to spit it into my napkin!! !